Whether you buy new or used equipment, you simply won’t find a better way to protect your investment. That’s because the Cenex Total Protection Plan® gives you unsurpassed coverage while helping to ensure that only high-quality energy products go into your equipment. When you use Cenex Ruby Fieldmaster™ premium diesel and Cenex lubricants exclusively, you’ll get up to 10 years or 10,000 hours of engine and transmission coverage for new equipment and 8 years or 8,000 hours coverage for used equipment. 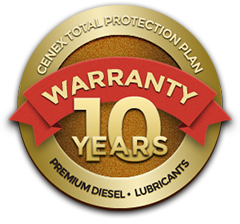 Ask us or visit the Cenex website to learn more about the warranty, which covers new equipment for up to 10 years or 10,000 hours (up to 8 years or 8,000 hours on used equipment), with no deductible.